Would you like to drive the Batmobile? If you were offered the chance to ride any superhero’s car which one would you choose? To be fair, the choices are a bit more limited than you might initially think. As a kid I used to be a big fan of Hong Kong Phooey’s versatile vehicle but it probably isn’t in great shape after all these years of being driven around by a mild mannered janitor. Then there’s the van driven by those horrible Teenage Mutant Ninja Turtles but I really can’t see myself in that abomination. The Gadgetmobile is another option I would have to quickly discard. Sure, it looks a bit better than the other ones we’ve considered so far but I would get confused by all those gadgets and would probably end up grabbing innocent passersby with the claw attachment. At the end of the day, if you want to drive a superhero car then there is really only one sensible choice; the Batmobile. Just ask Zac Mihajlovic. This guy lives in Sydney and he wanted a new car. To be more exact, he wanted a street legal Batmobile. This noble venture took him two years to complete and now he drives around the city looking incredibly cool. The vehicle is 20 foot long and is said to be an exact replica of the Batmobile used in the 1989 Batman film. In fact, in order to get it just right he went and looked for parts from the vehicle used in the film. The finished vehicle looks great and is made up of about 30% parts from the movie car. 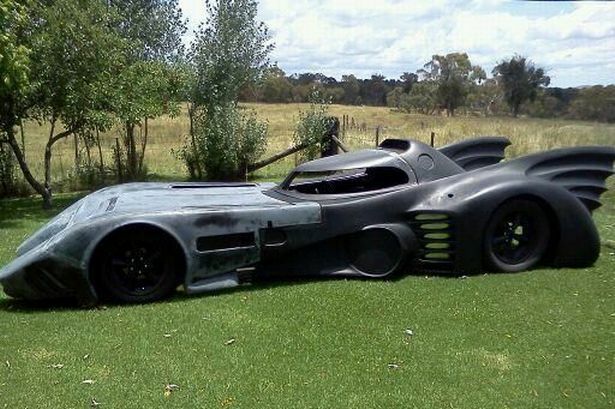 Someone has already offered around $1 million for it and it is believed to be the only street legal Batmobile on the planet. The owner currently uses it as a unique type of wedding hire service. Would you be happy to drive a car like this? This entry was posted in News and Views and tagged batman, batmobile, homemade cars, superhero car by Robert Bell. Bookmark the permalink.